"Grenzfall" combines fascinating beauty and power in itself and lives from this contrast that both unsettles and destroys. Claudio Fritz-Vietta understands his world as being an allegory to the meaning of the Christian festival of Christmas. 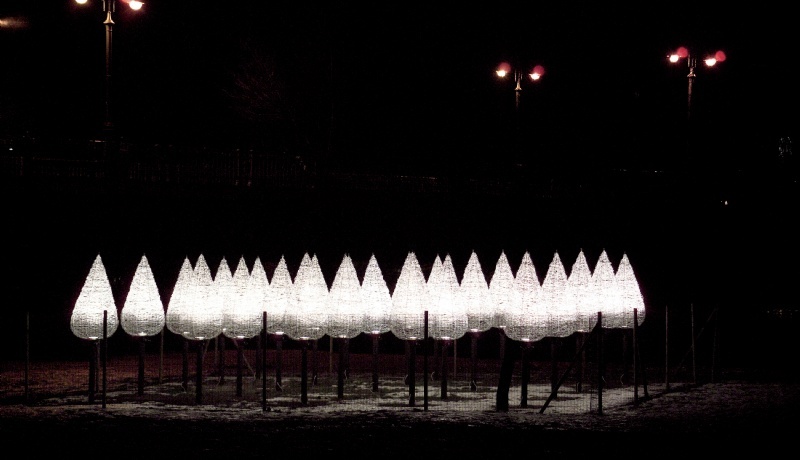 The aesthetics that the white light gives to the objects is in strong contrast to the aggressive reflection of the barbed wire from which the trees are formed. For the observer, the typified representation of the Christian God through the beaming white light in the inside of the trees seems to be unreachable and enraptured through the border fence. Barbed wire as a plain symbol for borders reminds the observer of his Christian duty for fraternising with fellow human beings, as well as the existing borders of this world.